Can the residents of this Texas town live there in peace? Has the Midnight, Texas TV show been cancelled or renewed for a second season on NBC? The television vulture is watching all the latest cancellation and renewal news, so this page is the place to track the status of Midnight, Texas season two. Bookmark it, or subscribe for the latest updates. Remember, the television vulture is watching your shows. Are you? Airing on the NBC television network, Midnight, Texas stars François Arnaud, Dylan Bruce, Parisa Fitz-Henley, Arielle Kebbel, Jason Lewis, Peter Mensah, Sarah Ramos, and Yul Vázquez. Based on the book series of the same name, from True Blood author Charlaine Harris, the supernatural drama plays out in the remote Texas town of Midnight, where nothing is what it seems. There, only outsiders belong, while normality is just plain weird. It is the best haven for people who need to hide from the world at large. The townies come together to form a sort of chosen family. Together they fend off external pressures from nosy police officers, vicious biker gangs, and their own dark pasts. The first season of Midnight, Texas is averaging a 0.74 rating in the 18-49 demographic and 2.99 million viewers. 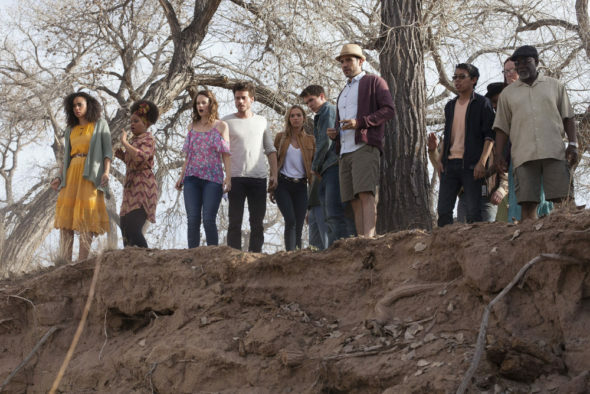 Find out how Midnight, Texas stacks up against other NBC TV shows. On February 14, 2018, Midnight, Texas was renewed for a second season, which debuts October 26, 2018. Stay tuned for further updates. Midnight, Texas was originally supposed to premiere in the mid-season, but in the end, the Peacock network held it for summer. What’s more — they only ordered ten episodes. While none of that adds up to anything definitive, it could indicate that they have less faith in the series. The ratings have not been very good so I suspect that the show will be cancelled. I’ll update this page as needed. Subscribe for free updates on any Midnight, Texas cancellation or renewal news. 6/19/18 update: Midnight, Texas season two premieres on NBC on Friday, October 26, 2018. Details here. Find more Midnight, Texas TV series news or other NBC TV show news. What do you think? Are you glad that Midnight, Texas has been renewed for a second season? How would you have felt if NBC had cancelled this TV series, instead?